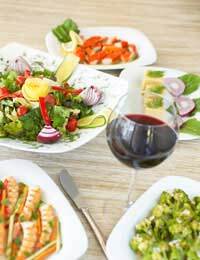 The pairing of wine and food is a ubiquitous as food and drink are! Food and wine are a natural combination – one that is so deeply ingrained that it is in all probability an innate instinct by now. It must be remembered that for a large period of history in many countries wine was drank in place of water so the pairing of food and wine was naturally essential to survival. It seems odd then that so much is done on the part of certain food and wine connoisseurs in the way of making this very simple and natural combination sound complex and intimidating to the layperson. It is important not to be put off pairing food and wine by experts that make the whole thing look like a chore that if not performed correctly will make you look daft in front of your peers! Really it is they who are daft: Ignore them and make your own rules. Here follows some advice to help you along your way. Combining food and wine really, obviously, amounts to combining the flavours and aromas of both the food and wine. To know how a wine and food are best matched, therefore, requires nothing other than an idea of how they both taste. Of course, the outcome will depend largely on personal experience and judgment. It is that simple. Problems may arise when one is unsure of the taste of the wine, the food, or both. Here are common sense prevails: read the label on the wine, which often gives food matching tips. If in doubt, generally go for a red wine with meat and a white with fish. White can be enjoyed with white meat too. Game tends to go well with fruity reds. These are the traditional and most basic guidelines. I may be noted, that the production of bold and heavy New World whites fly’s in the face of convention here: A new world Chardonnay may go down well with red meat! In fact, of course, there is no reason why white shouldn’t be enjoyed with meat, or red with fish, if that’s what appeals to you or your guests. Whilst we can see that the rules are made to be broken, it must be noted that occasionally, when you see a wine expert go into raptures it is for good reason. Some wine and food combinations compliment each other so well that what would have been an ordinary meal, or drinking session, becomes an ‘experience’. This may sound pretentious, but it is just true. Try, for instance the widely available New Zealand Oyster Bay Sauvignon Blanc (available in Supermarkets for around £8) with Salmon, or a Marks and Spencer’s Bourgogne (from £6-8, depending on variety) with a Tesco’s Finest A.O.C. Eposses cheese. One good way of discovering one of these combinations is to research using books or the internet and match food to a good wine that you particularly like. One of the great things about doing this is that once you have found an ideal combination you can return to it again and again. If you have a whole repertoire of combinations, you can enjoy great food and wine combinations daily. Finally, it must be noted that pairing food with wine is central to the culture of many countries. Italians, for example would not dream of drinking wine without accompanying foods. This is a much healthier and more fulfilling way to drink, than in the English style. It’s a shame to say, but frankly, drinking habits in the U.K. conflict with reason: drinking good wine with good food is just much more enjoyable than necking a bottle of cheap plonk, forgetting to eat, and then waking with a god-awful hangover!